It is quite impossible to represent most large cities of the world in the collective imagination without linking them to those elements or places that play an emblematic role within them. To think of Paris without the Eiffel Tower, or Rio de Janeiro without Christ the Redeemer would be as traumatic as referring to Havana without the physical and subjective presence of the Malecón. The kilometers-long wall, which is a perfect place for lovers, has seen Habaneros—and outsiders—come to celebrate their joys, lighten their sorrows and heartaches, or simply share ideas and projects with friends or loved ones. In difficult times, it has behaved as a fairly reliable gauge of the symptoms and most significant events that take place within Cuban society. Having said that, it is quite obvious that this dynamic space could not be left out of the interventions occurring as part of the 11th Havana Art Biennial. Occupying a considerable stretch of the Malecón is the project Detrás del muro, or Behind the Wall, whose key feature seemed to take hold of the notion of ? ?multiplying the senses through the diversity of aesthetics, which ended up moving in two directions. The first one comes closer to the more ephemeral performance art; the second one with fixed pieces, many with an interactive content, complex conceptual proposals, which would remain longer in space. On the evening of May 13, 2012, a colorful frenzy broke out around the legendary wall. The enthusiasm was shared among artists and audiences who, in a rare conspiracy, sought to enjoy and at the same time reflect on certain ethical and other complex issues of our reality. It did not take long for the public to take notice of the art action of Maria Magdalena Campo, a Cuban artist residing abroad, who, followed by a large crowd, ritualized in parodic style a number of topics of our popular culture and aspects related to the desire to consume, truncated somewhat by scarcity and shortage. She also addressed the attraction that “trophies” from abroad hold on the inhabitants in the island. Along similar lines, Reinier Leyva’s performance Mirando al mar [Looking Out to the Sea] invited the city’s inhabitants to go for a few minutes into a trance of grief and hope, in which the eyes would eventually demand something more of the horizon, looking out without searching for physical objects, or drugs dropped from afar; an extension of our longings through the swells with the clear objective to continue interrogating ourselves about our destinies. 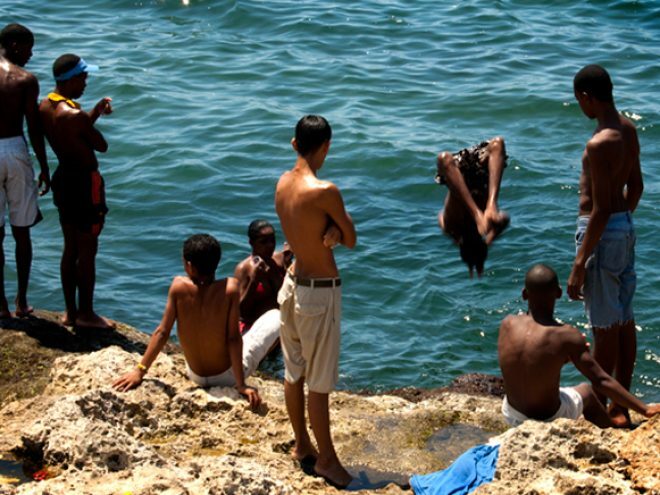 Perhaps the most intense and extreme of all of the interventions was the performance by the young artist Carlos Martiel, who showed himself naked on the rocks pierced by numerous hooks which mercilessly penetrated his flesh, and were tied to several fishing lines held by a boy who was sitting on the wall. Those of us who are already acquainted with the presuppositions in Martiel’s aesthetics know that in each of his performances he seeks to look back on his traumatic experiences. These interventions have differentiated and personalized him, submitting himself to extreme situations, both physically and psychologically. As to the fixed pieces, which will last longer together with the uninterrupted sound of the water crashing against the rocks, several captured our attention, like the huge rustic oars built by Kcho as part of the piece Pueblo de Gigantes [Country of Giants], a clear metaphor of the power of endurance that a nation can achieve. On a more sober tone and flirting with beauty, but cleverly exploiting the potentials of space, Alexandre Arrechea’s sculpture, entitled Nadie escucha [Nobody Listens], shows broad opportunities for interpretation as one of its strengths. Another piece that cannot be missed is Fly Away by Arles River. The assemblage consists of a fence with a hole in the center. Its meaning is understood when one discovers that the space in the hole ends up delineating the silhouette of an airplane, no doubt expressing a very dynamic and suggestive sensation.